HUNGRY NOW? GET IT DELIVERED! Chunks of chicken breast seasoned, skewered and grilled golden, drizzled with teriyaki surrounding a creamy soy sauce for delightful dipping. We’ve skewered the shrimp and grilled them perfectly for you to attack with your shark-like hunger. If you’re feeling saucy, ask for some homemade cocktail (and we don’t mean the rooster) or garlic butter. Fried potato boats passengered by cheese, bacon and chives. Sink them in sour cream that’s on the side. Southern fried charm with in-house smoked pork mixed with collard greens and smokey BBQ, rolled and fried golden with a side of chipotle ranch. Basically, a pepperoni pizza rolled up and fried with the sauce on the side! Life is great! Nacho Mama’s tots! We smother ours with our homemade chili, topped with jalapeños and a blend of two cheeses. Bring your big boy appetite. Poppers done our way. Wonton wrappers stuffed with three cheeses, jalapeños and chives, fried golden and served with blueberry dipping sauce. You can thank us later. They’re sweet; they’re potatoes; they’re fried, and they’re delicious. Blended cheese, bacon and chives atop crispy fries with homemade ranch on the side will have you standing on the roof of your house yelling for more! Crispy fries with blended cheese and gravy all over the place and all over your face! These will philly-up your belly! Crispy fries topped with shaved ribeye, sautéed onion, blended cheese and queso. Get your fork ready! It’s creamy, cheesy and sort of healthy because of the spinach and artichokes…right? Two of the best things ever invented (cheese & beer) come together for a tangy dip that will hit the spot. AND there are two giant pretzels for the cheese to mouth vessel! Beer! Battered! These are delicious! 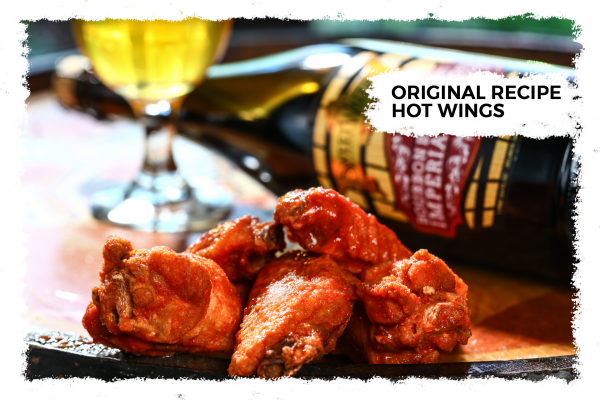 Try them plain or buffalo style for a kick. Cocktail sauce, ranch or bleu cheese are all great dipping options. Delicious dill chips fried perfectly and served with homemade ranch. YES! Another southern delight fried just right. The avocado ranch sauce will have y’all kindly asking for more. Fresh cauliflower chopped into bite size pieces (unless you’re a big mouth) fried crispy. Plain or buffalo style with ranch or bleu cheese. Someone say put a ring on it? This version is cheaper and edible! The tangy sauce with them will keep you sassy. These whole mushrooms fresh from the field are fried and will have you trippin’ on how good they are. With homemade ranch for your dipping pleasure. It’s cheese and it’s fried, need we say more? Oh, maybe that it comes with marinara. Fresh fried tortilla chips are smothered by blended cheese, queso, lettuce, tomato, onions, black beans and chives with some sour cream and salsa on the side. Cheese, grilled onion, mushrooms, black beans, red & green peppers. Chicken, wing sauce, blended cheese with choice of bleu cheese crumbles or ranch dressing. Varners Fresh and Never Frozen Chicken Wings are said to be one of Atlanta’s best. We invite you to be the judge! Choose from our many flavors and we’ll serve it up with your choice of fries or celery and carrots. You like options? We’ve got options. All are cooked to order; choose from 100% fresh ground beef, grilled chicken breast, ground turkey or a veggie patty, served on a freshly baked bun, with fries. Every Wednesday all craft burgers are only $6.95! * (dine in only, 1 per person, drink purchase required.) Chicken breasts are NOT included in the Wednesday 6.95 Special. An oldie but a goodie. Lettuce, tomato, onion choice of cheese. Cheddar, Swiss, Provolone, Blue Cheese, Blended Cheese, Pepper-Jack, White or Yellow American. It’ll be a big A in your book! Bacon, provolone, lettuce, tomato, onion rings and homemade ranch. Get your napkins ready! Mozzarella cheese, pepperoni and marinara sauce on a garlic bun. Your Dad would be proud! Homemade chili, onion rings, blended cheese and garlic aioli. You’d better check with your spouse! Bacon, cheddar, fried egg, lettuce, tomato and garlic aioli. You’ll be asking for a re-Pete of this one! Bacon, cheddar, sautéed shrooms and onions, ketchup, mustard and mayo. Spice-a-licious! Blackened meat, sautéed onions, ‘shrooms with a bacon and chive bleu cheese spread. It’s like a two-fer!! Pepper jack cheese, shredded lettuce, tomato, onion and chipotle ranch with cheese quesadillas for a bun. Cod you ask for any better fried fish?! We think not! Three pieces of fresh cod, dipped in our beer batter, fried to a beautiful golden brown, served with fries and tartar sauce. Scrumptious shrimp beer battered and fried to perfection. Served with fries and your choice of cocktail or tartar sauce for delectable dipping. Two skewers of grilled shrimp and your choice of side. Garlic butter or cocktail sauce on the side – you choose what makes you happy! We’re not messing around with this one, hope you’re hungry! Our in-house smoked pork tossed in smokey BBQ sauce and hand pulled chicken tossed in honey BBQ sauce with mac ‘n cheese and toast. Mixed greens, tomatoes, onion, cucumber, blended cheese and croutons. Heart of romaine, parmesan cheese and croutons. Bleu cheese crumbles, bacon, fried mushrooms and red onion. A bed of romaine topped with tomatoes, bleu cheese crumbles, chicken (served cold), avocado, bacon, boiled eggs and chives. Our delightful dressings are made right here in our very own kitchen! You’ll think you’re actually in Philly! Choose from the classic shaved ribeye or a grilled chicken breast on a soft hoagie topped with sautéed onions and provolone. Add red or green peppers, mushrooms, jalapeños or marinara. .50 each. A delightful classic sandwich done right! Swirled rye with grilled freshly sliced corned beef topped with sauerkraut, swiss and 1000 island dressing. So good you’ll wanna slap yo’ friend! 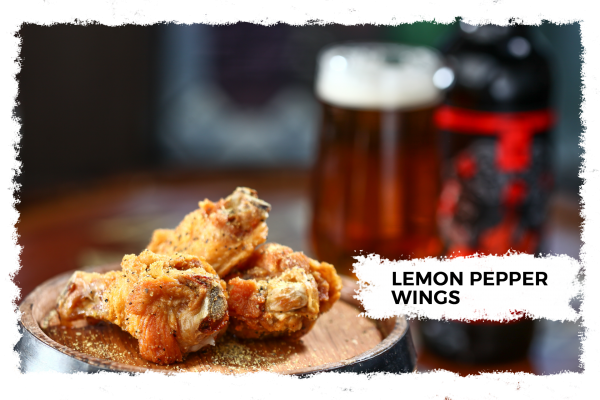 Choose from fried or grilled chicken that we chop and then toss in our own amazing wing sauce. Wrapped in a flour tortilla with lettuce, tomato and choice of homemade ranch or bleu cheese dressing. Three chicken tenders tossed in our signature wing sauce topped with bacon and swiss cheese served on a bun. You can’t press us for a better sandwich! Cuban bread, in-house smoked pork, ham, swiss with spicy mustard and pickles, all perfectly pressed. A trio of cute deliciousness! Three sliders with freshly fried chicken tenders, mustard, pickles and queso. Meat and cheese forever! 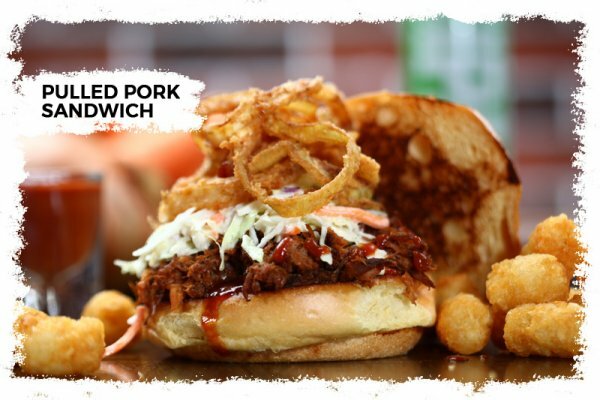 Our in-house smoked pork on a hoagie smothered in Sierra Nevada beer cheese and topped with chopped onion. Easy eating with one from the Big Easy. Fried shrimp adorn this sub, along with lettuce, tomato, pickles and chipotle ranch sauce. This sandwich will wreck you like they wreck the bridge! Grilled chicken breast with spinach, bacon, tomato, avocado and chipotle ranch. 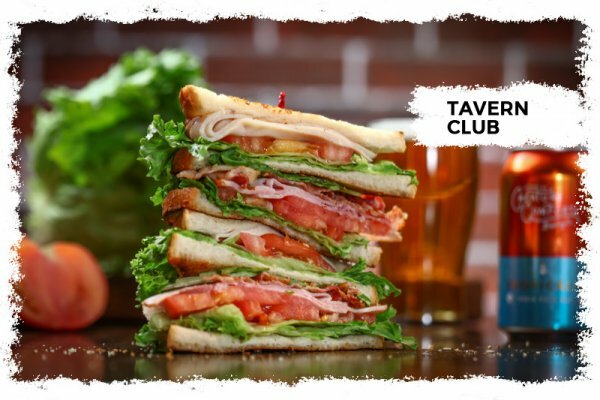 You’ll need to loosen your belt after this delicious sandwich! Classic BLT with over easy egg.